A cascade of Raspberry-pink blooms in your spring garden. The perfect choice for spring and early summer colour in the garden with a profusion of raspberry-pink blooms. A vigorous climber, superb on fences and archways or to screen unsightly areas. Problem free low maintenance, grow in any sunny or part shaded spot. Easy to care for, pruning is simply a case of tiding up the plant once it has flowered. Supplied as a strong growing plant in a 2L pot. Named after the Dutch artist Vincent Van Gogh, the stunning, subtly fragranced flowers of this montana clematis are a rich raspberry colour - something rather unusual for Montana clematis. 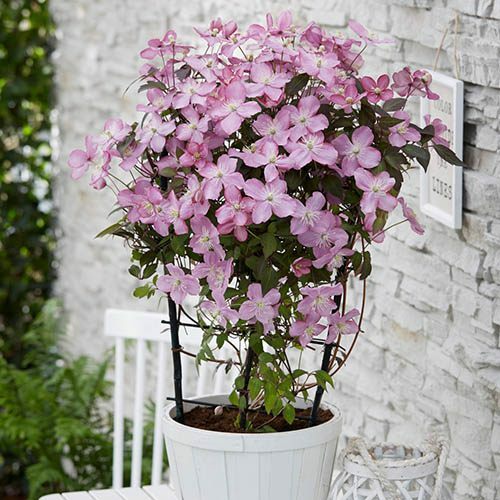 A superb choice for early season colour in the garden, clematis 'Montana' are the perfect choice of climber for covering unsightly fences with fabulous colour. Growing fairly quickly, you will get a fine display from 'Van Gogh', plant it anywhere where it can climb - pergolas and arches or even old tree stumps are ideal - and you'll be rewarded with thousands of pastel blooms in May and June.